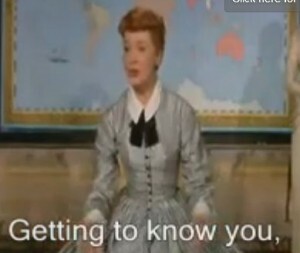 “Getting to Know You” is a well-known song from the Rodgers and Hammerstein musical “The King and I” and I taught it to classes for many years. It’s very appropriate to teach in school as it is sung by Anna, the new teacher, in the musical to the children in her class. The song is especially appropriate to teach at the beginning of the school year when you get a new class as the words are very meaningful.